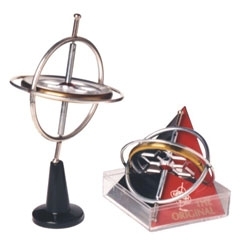 The original, classic gyroscope! Gyroscopic forces have amazed mankind for hundreds of years. Now these amazing forces are yours. You can perform feats that seem to defy gravity. The gyroscope will spin on its pedestal... dance on a string tightrope..balance perfectly on the lip of a drinking glass. Discover the secrete and make your gyroscope do these and other astounding tricks. Complete instructions, pedestal, and string included.